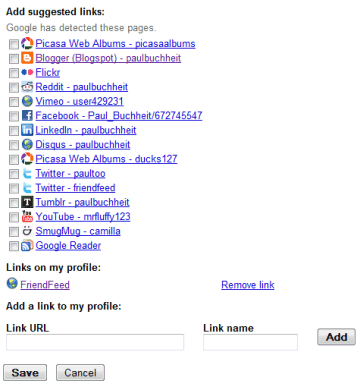 Google started to use the Social Graph API to suggest links that can be added to your public Google Profile. If you add links to sites that are connected to other sites using FOAF or the XFN microformat, Google makes it easy to import all the links. For example, if you have an account at FriendFeed, add a link to your FriendFeed page to import the sites you shared: videos uploaded at YouTube, Google Reader shared items, del.ico.us bookmarks etc. Google's unified profiles are slowly added to all Google services that allow user-generated content. "A Google Profile is simply how you represent yourself on Google products — it lets you tell others a bit more about who you are and what you're all about. You control what goes into your Google Profile, sharing as much (or as little) as you'd like," explains Google. For now, the profiles are displayed next to the list of shared items from Google Reader, in the Google Books library and next to the custom maps, reviews and edits from Google Maps. The next will be for them to let you add iGoogle widgets to your profile page. ie add you Friendfeed, your photo albums, a skype button, a gmail button. It should end up looking exactly like a facebook profile page. The only thing they need to deal with now is privacy. I want to be able to share all information with my friends but limit the amount I show to anyone else. Doesn't seem to show "as much as you'd like". You're limited to sharing only 10 links (at least I appear to be). Yes limited links. Should be available to GoogleApps users as well. Your YouTube username is mrfluffy123? All the suggested links from the screenshot are for: friendfeed.com/paul (Paul Buchheit's page at FriendFeed). Humm, no suggested links for me, is this a measured roll out? whether there are a privacy settings?or not because its quite an important aspects for the sites.